Prestel�::�Micronet 800�::�Celebrating the Viewdata Revolution. Possibly the biggest, and certainly the most successful of the Prestel IPs (Information Providers). Micronet 800 was a partnership between East Midlands Allied Press and British Telecom. Unfortunately they never hit their target of 100,000 subscribers. Launched in 1983 targeting Tandy, Apple, Sinclair ZX81, Dragon and RML-380Z machines, their core market quickly became users of the Sinclair Spectrum, BBC Micro and Commodore 64 - Not surprising, as these were the most successful home computers of the 1980s. A PC package was later available, too, but because of the limitations of the graphics on early PCs, was not very successful. Micronet was instrumental in popularising online communications with the first generation of Home Computer users. One of their more successful promotions was giving away free modems with a years subscription - made possible by their buying the stock of the collapsed Prism Microproducts at knock down price. 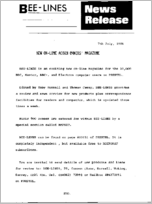 Initially Micronet was intended to be in a traditional magazine style, with news pages, editorial, reviews, software etc. Quickly, however, the ability for readers to easilly interact and give feedback to the writers quickly moved the service into a much more interactive and user-driven direction. Among the revolutionary features introduced by Micronet were "Chatline", whereby messages from users were automatically and immediately republished so that everybody could see them and respond in kind, the "Gallery" where any user could rent their own page and publish what they wanted, and their brining MUD to the attention of the masses, through a partnership with "Shades". Another popular feature was the Celebrity Chatline. Many actual real celebrities were interviewed live on-line with questions being submitted by the members. Here we have one of the last, on the occasion of Micronet's 1989 move of offices. 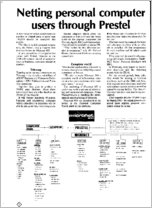 Together with Viewfax 258 and ClubSpot 810, they became part of the larger "Prestel Microcomputing" branding in mid 1984 whereby subscribers gained access to all three services. Many special interest groups sprung up catering for different computers, activities, or even for rather undefined reasons! TMMC stands for The Midnight Micronetters Club which started life as just a group of late night Chatline users, but eventually spawned an entire section devoted to their activities and get-togethers. You can now visit them here, although be warned: it's not complete, and there are lots of links that don't work. This is the final incarnation, from the days before Micronet closed. Here you can access the TMMC/Micronet Virgin Users' Microsite - for new users, rather than anything to do with Richard Branson.. This still makes a good introduction for viewers today, explaining all about how the service worked. There are lots of links into the rest of Micronet and Prestel, which we don't have, so don't panic if you get an error telling you a page doesn't exist: just hit BACK and try something else. 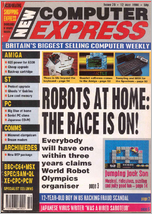 In late 1989, an edition of PC Plus included an offline interactive demonstration of Micronet, powered by a 16-bit DOS programme called "Axis Microbase". With thanks to Ant for supplying a copy, and with the wonders of modern web technology, now you too can view this snapshot of the 'net! 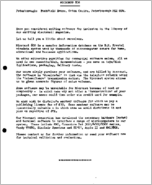 Click here to access Micronet 1989! Bought out by BT in 1989, Micronet closed down in 1991 when BT decided to concentrate on network service provision rather than value-added services. 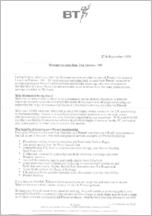 The official line was to push CompuServe to the members, as shown here in the September 1991 letter. Much of the on-line content, howver, was promoting The Silicon Village; many Micronet staff made no secret that this was where they would be found. We're still looking for backups and archived pages, so if you have any further examples, please get in touch! Why not check out the Brochures to see how Micronet promoted themselves. "Netting personal computer users through Prestel"
Interesting article about the imminent launch of Micronet 800. Includes the impressive "They hoped to hit the 100,000 target by March 1983"
Review in Spectrum Computing Review and screenshots from 1984.
download pdf - view online Page with a news item regarding the "Micronet Clampdown" - BT's decision to pull the plug on the Micronet chatlines - arguably the most popular parts of their service!